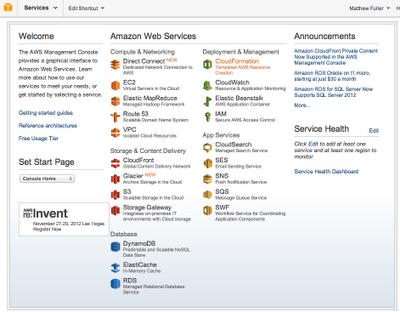 A project I've had in mind for a while is to use Amazon's Cloud (specifically an EC2 instance) to setup a honeypot. 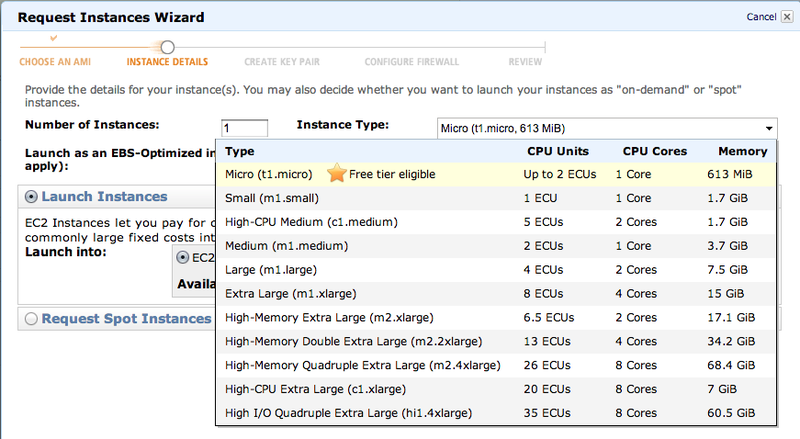 Luckily, Amazon has been offering a low end, free tier of service for an EC2 instance, which is just what I need for this project. In this post I'm going to walk through exactly what I did to setup a medium-interaction honeypot known as "Kippo" on an Amazon EC2 instance completely for free (at least for one year). This isn't as straightforward as it seems because, with the free tier, you only get one IP address. This means you can't setup your honeypot for SSH on one IP and the admin/machine SSH on another. Don't worry though, we'll fix that. 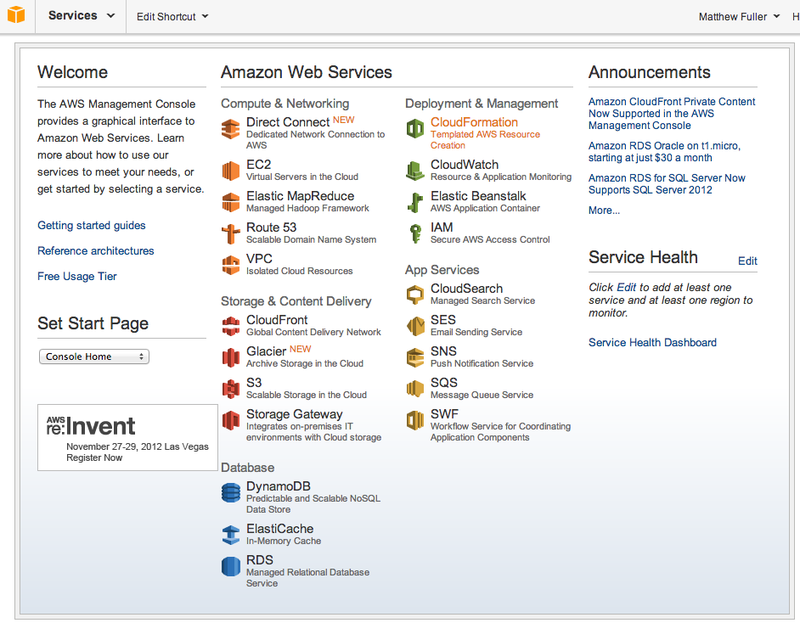 Click on "EC2". Now, launch an instance by clicking "Launch Instance." Choose the "Classic Wizard" and continue. Now, select the Ubuntu Server 12.04 64-bit image (note: instances included in the free tier are marked with a star). 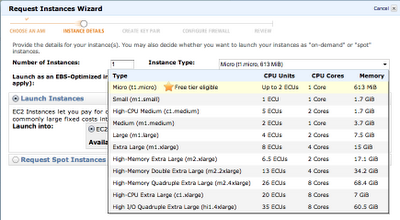 Choose one instance, and an instance type of "Micro" with 613MB memory (note: this is also marked with a star). Click "continue" through instance details, nothing needs to be changed. Next, create a key pair and save the resulting .pem file. You will need this to SSH to the server. 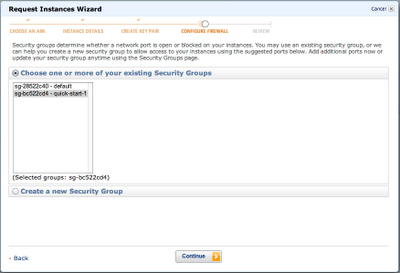 For a security group, select the quick-start group from the left. Now, you can review your instance and create it. The instance may take some time to initialize. Once it finishes, you should see it running under "instances." Now, create a new elastic IP for your machine. This will allow your machine to retain a single IP through which attackers can SSH. Click on "elastic IPs" under "Network and Security." Then, allocate a new IP address. In many cases, honeypots will have two network interfaces - one for the attack surface, another for management. Each interface would have a different IP address to separate the attack surface from the management. However, Amazon's free tier allocates only a single elastic IP. Do not create a second IP or you may be charged for additional usage. 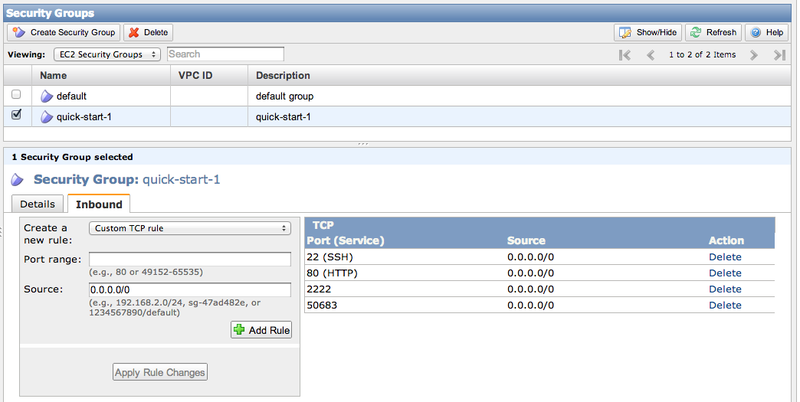 Once you have an IP, make sure it is pointing to your running instance. "Ubuntu" is the default username for the instance. To get around the IP address restrictions, we're going to run the management SSH on a non-standard port and the honeypot on the typical port 22. This will allow us to both obscure the management connection and increase the number of attacks seen by the honeypot (almost every attacker will try port 22 for SSH first). To change ports, we need to edit the configuration file for the already-running SSH server and then restart the service. Do this carefully or you may lose access to your machine. Change this port number to something between 49152 and 65535. Make sure you write it down and do not forget the port number you selected. When you run this command you will likely be disconnected from your machine. Hopefully you "restarted" and didn't "stop." You will now need to edit the Amazon security rules within your AWS console to allow your new port on inbound connections. To do this, click "Security Groups" under "Network & Security." Then, click on the "quick-start-1" group and then the "Inbound" tab. Add your new port number and be sure to apply the changes. You can see that my port is 50683 in this case. Now, reconnect to the machine by running the following command. 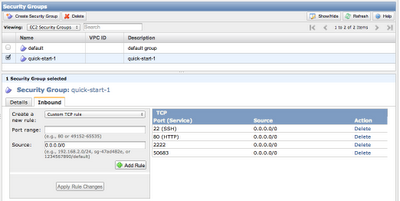 Note the added -p parameter to specify the port number. *Note: you can create an SSH configuration so you don't need to specify all these options for every connection but that is beyond the scope of this guide. Hopefully you have reconnected to your machine. SSH is now running on a port other than 22 which will allow us to use the standard SSH port for our honeypot. *Note that you should not need to update Python. Also, when downloading the Kippo source, be sure to use the latest version as this guide is a bit old. Finally, you will need to add the IPTABLES rule to redirect port 22 traffic to port 2222.
and be logged into your honeypot. *kipuser may be replaced with the username of the kippo user you created. This will replay the attacker's interaction with the system. Hello Mathew. I enjoyed your post but I think you should check the Amazon TOS for clarifications on these type of systems. You might want to check this post: http://bruteforce.gr/logging-kippo-events-using-mysql-db.html to enable SQL logging and then use my tool at: http://bruteforce.gr/kippo-graph to visualize the results. Cheers. Hi Mathew. I had a question regarding your current usage. Do you see any hidden costs associated with the free version once the honeypot is up and running.Just thinking in terms of disk-space for the logs. Hi Anon - there aren't any additional charges unless you go over a certain usage (however, the free usage tier is more than enough and if you do manage to go over, they'll warn you first and won't charge until you approve it). The disk space is relatively low as well. From what I've seen, it'd take several years before the log sizes became an issue.